The age of futuristic machines has taken control of the present generation. Be it, kids or adults, all are going insane about the hoverboards flashing in the headlines. The question is, whether these hoverboards can be safe for you and your family. Well, for those who are craving to buy one for yourself, it a good news for you. The OXA units manufactured today have gone through rigorous tests and after that only they have accredited the UL 2272 certification. Before you actually make a purchase it is important for you to extensively research and find out about the hoverboard you are interested in. Now since you are looking forward to the OXA self-balancing electric scooters, we shall take you to a journey wherein you can get familiar with its pros and cons. With the OXA electric scooters, you no more need to worry about your feet slipping on the board because it has special sensors which figure out and automatically balances you well on the hoverboard. The intelligent gravity sensors make it easy for the beginners to make a brilliant start. To your astonishment, even the kids can learn to ride in just a couple of minutes. You step up and the magic begins. These self-balancing electric scooters can operate in two different modes. One is for the beginner’s stage, with auto self-balancing system which makes the ride smooth, steady and easy to handle. You do not need a professional trainer to make you a pro. Within a very short interval of time, you can be seen flying across the street. On the other hand, the normal mode is the one with no auto self-balancing feature. So, those who are good at riding will find it a giving wonderful ride. This hoverboard is not specific to any one age group. The kids, the adults or anyone can take a full-fledged fun ride on OXA electric scooters. These are reliable and have different modes to switch into through which it can be used by learners as well as the pro. So whether you are wishing to give your friend a gift this Christmas or want to surprise your kid on his birthday, you can trust this brand in all dimensions. The lithium-ion batteries used in the manufacture of OXA hoverboards are advanced and are free from the problems of short-circuiting, overheating or leakage. It is qualitative and built to the safety standards. This is something which most of the other hoverboards do not provide. It offers a great weight capacity with 330 pounds being the maximum limit. So, even a very hefty person can take a ride on this electronic scooter and not affect its quality. One of the amazing features of these hoverboards is their exclusive built accompanied by the 4.2 Bluetooth speakers. You can go on a morning ride with your favorite song and that can make your entire day, it is such a bliss. The quality of sound is decent and you sure will have no complaints about it. Many of the parents have given their reviews and said that their kids simply love the music during their ride. If the fear of fire accidents and sparkling due to the battery overheat and other safety concerns stop you from getting an electric scooter for you or your kid, then we must tell you with OXA smart balancing safe scooters you will have not a single safety issue. There are no doubts it is certified by the world’s best safety standard enterprise and thus, making it reliable and safe for you and your family. The speed your hoverboard runs it is also a matter of concern to many of the riders. That is why we have come with all the statistics ready. The maximum speed that these hoverboards cover up to 8 mph. The amazing range of 12 miles non-stop in a single charge is simply one of its greatest features. Unlike most of the high time taking self-balancing boards, these take just about 2-3 hours to refill the charge. You will not need to wait half of your day to go out with our friends and enjoy your holiday. Just a few hours and you are get set go. The strong and rectangular built of these hoverboards gives a sturdy impression in the first go. When you step on the board, you will understand its true strength. These are built in a stylish fashion and feature the best material for its manufacture. The colour variation is not much and you can easily get a stylish model in red colour. The mainboard frame is made from the red aluminium alloy and thus gives it the colour. Most of the customers say that it is more of a deep pinkish red and gives a stunning radiance in sunshine. The price of OXA is pretty attractive as well. 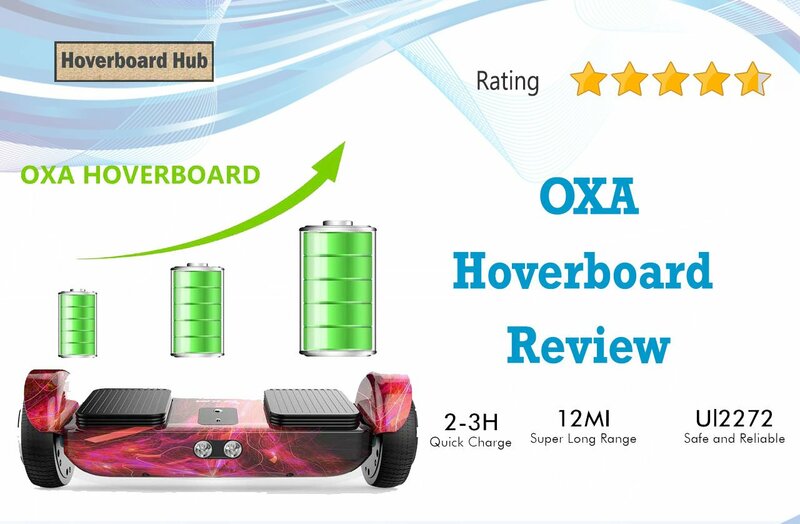 You can get a fine deal by getting it a price of $300 and that is a great budget amount which you can invest in the everlasting, safe and best OXA hoverboards. So overall what we can say is it is a good investment to make in OXA self balancing hoverboards. Every coin has two sides and likewise there are some limitations to these as well but they can be avoided if special care is taken. The price too is pretty much cool and it is going to be a great decision to bring it home. We hope you have a gala time on your hoverboards with the music on.